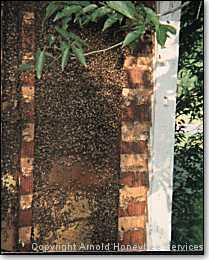 In a wall, in a tree, in the eaves of a roof...honeybees often look for new homes - and can pick yours! Aside from the inconvenience (and discomfort) of sharing your home with a swarming insect, honeybees can cause serious damage to your house, inside and out. Poisoning a colony is never effective - it only results in a worse situation and a bigger mess as the dead bees decompose, attracting other pests; and as the honey and wax melt, interior walls can become stained and damaged. This costs homeowners both time and money to repair the damage. And unfortunately, most pest control companies will not remove honeybees. 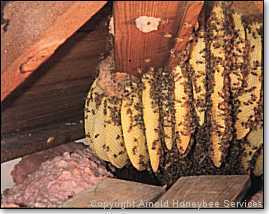 Arnold Honeybee Services has 20 years experience in extracting honeybee colonies from homes, apartments, and office buildings. It’s a hard, messy job, but we do it - and do it right!. Extraction methods vary widely depending on where and how the colony is situated (in the roof, eaves, between drywall, dormer windows); how long they’ve been there; and what building materials are involved (siding, shakes, or cinderblock). 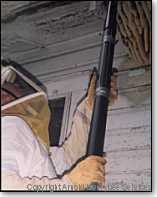 We either vacuum or trap the bees and move them to a place where they can forage. Then we manually extract and dispose of all honeycomb. We do all carpentry and building repair involved in the extraction, or if you prefer you may use your own building repair expert. Call or email us for details. We travel anywhere in the East Tennessee area.